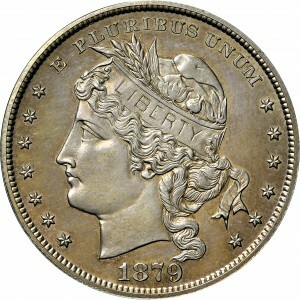 Note the yellowish toning on this coin. It is this appearance that led Harry Bass to determine that this example was produced in the goloid alloy. 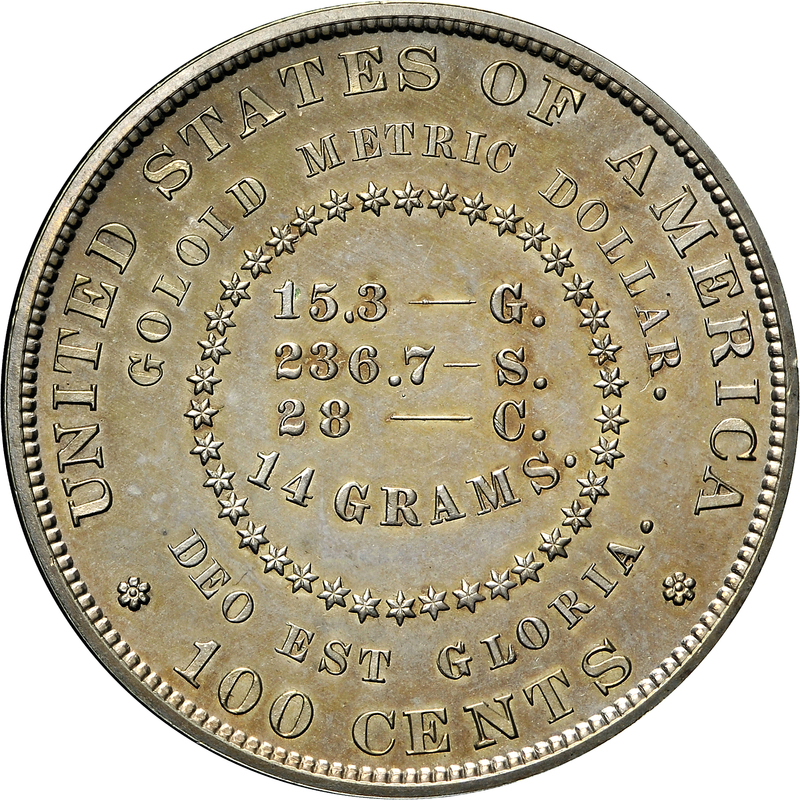 Most numismatists believe that the yellowish appearance is due to the small amount of gold in the alloy. Specific gravity is a useful test to distinguish between two alloys; however, it requires very accurate testing results when the two compositions have similar densities. Color alone is not sufficient to make a determination. From Lester Merkin's sale of February 1971, Lot 922. Head of Liberty to left wearing cap decorated with cotton and wheat, LIBERTY is inscribed on cap, hair tied below with ribbon, E PLURIBUS UNUM is above head and date is below, 13 stars around. 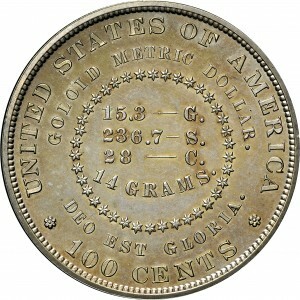 A circle composed of stars contains 15.3 – G. / 236.7 – S. / 28 – C. / 14 GRAMS., motto DEO EST GLORIA in field directly below circle, denomination GOLOID METRIC DOLLAR is directly above, UNITED STATES OF AMERICA at top periphery divided from 100 CENTS at bottom periphery by cinquefoil.